Last edited by 1966stang; 08-15-2012 at 05:06 PM. If you're not consuming too much oil between oil changes (<1 qt. ), try installing a oil-separator to reclaim some of the oil that is being pulled through the PCV lines. I do 6,000 mile intervals with Castrol 5w20 Full-Synthetic (Titanium) and Mobil1 filter and consume ~1/2 qt. I had to add 1.5 qts after 10k when i changed my filter (5k on the oil), bout 1/4-1/2 quart went into the filter. FYI those plugs are the cam position sensors. How many miles are on it? 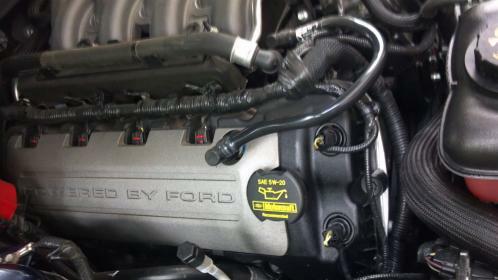 Am I the only one that questions why ford puts 8 quarts of oil in a 5.0L v8? For Christ's sake, a 8.0L v10 dodge viper only holds 8 quarts. What am I missing? It acts as a heat sink, the oil absorbs heat and then has enough time to cool down, respectively, while its in the pan. Less oil and the oil temps would be higher. That plug is part of the the VCT wiring, BTW. You dont actually 'remove' or 'tighten' them. Oil separator ? How important?